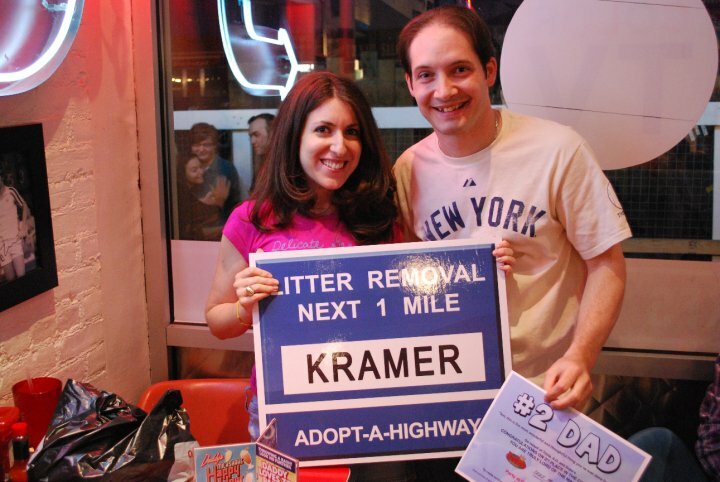 When I attended my first Seinfeld trivia night back in December, I never anticipated the chain of events I’d set into motion: I’d interview the trivia host, Dave Oliver and we’d become fast friends; I’d write my most-read blog post ever based on that interview; I’d join Dave’s company, Trivia, A.D., as a consultant; and I’d help him host a Seinfeld trivia night at Tom’s Restaurant, a.k.a. Monk’s Diner from the show. Still, none of the above is so unbelievable that you’d doubt it if I put it in a blog post. Slightly more unbelievable, though, is that on the night of the Tom’s event, I’d find myself in an Italian restaurant a few doors down from the diner, explaining to Jeremiah Birkett (the guy who played oversleeping marathoner Jean-Paul Jean-Paul on Seinfeld) and Lou Cutell (who played Dr. Cooperman, a.k.a. The Assman) that in about a minute, I’d be bringing them down the block and through the front door of Tom’s for their surprise guest appearance in front of a crowd of 80 trivia players. What separates Tom’s Restaurant from any other coffee shop or diner I’ve ever been to is, well, not much, actually. 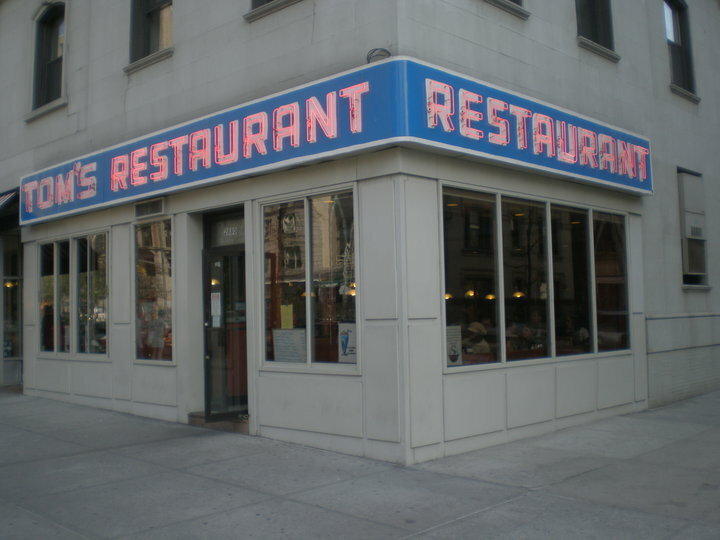 If I didn’t know it was “the coffee shop from Seinfeld”–or recognize the neon “RESTAURANT” sign on the outside–I never would have figured it out once I was sitting inside eating my grilled cheese and rice pudding at the counter. Tom’s restaurant on upper Broadway and 112th Street has been serving Columbia University and the surrounding communities since the 1940’s. Tom’s became a legend through Recording Artist Susan Vega’s “Tom’s Diner” Song and even more so after appearing repeatedly on the world famous Seinfeld TV program. On the wall to the right, there are a few enlarged and framed TV Guide covers featuring Jerry, George, Elaine and Kramer. And in the very corner, tucked between the front window and the counter, is “The Kramer” portrait, which Tom’s sells as a poster for $12. I decided not to ask the owner–Mike, not Tom–whether anyone has ever bought one. To the locals–for whom Tom’s closed its doors for two hours while the trivia was going on–it’s just a diner where they go sometimes for a cup of coffee and a piece of pie. A wi-fi-less place for Columbia students to take a study break. A rare NYC eatery that doesn’t serve alcohol and only takes cash. As trivia teams started to file in, Mike checked names off his list of reservations. I asked him whether his place was usually this full on a Monday night. He smiled and shook his head. The guest list for the evening was invitation only, based on those teams who had been to Dave’s Seinfeld trivia nights before. The list of team names read like a Kentucky Derby race card if Jerry Seinfeld owned all the horses: Spongeworthy, I Was in the Pool, Mulva, What About the Driver?, and the odds-on favorite, Why No T-Bone? The pre-trivia buzz for an average Seinfeld trivia night typically carries the nonchalance of any weeknight happy hour. But at Tom’s, the atmosphere seemed a little more tense. As teams assembled and claimed their booths or spots at the counter, I gleaned bits of one team’s conversation as they quizzed each on the minute details of specific episodes. I even heard one woman say, “I was studying my flash cards last night,” with a straight face. And when Dave read the first question–“In the episode, ‘The Doodle,’ Kramer and Newman wait all year long for the Mackinaw peaches. Where do they come from?”*–the diner grew eerily silent as everyone considered their answer, knowing any misstep, even on the first question, could cost them. It felt like we were proctoring the SATs. Hoping to raise the event’s profile, Dave had reached out to the agents and publicists for every Seinfeld actor he could think of in the months leading up to the event. Who knew, maybe one of them would actually show up. While most were either out of town or simply too busy to come, many sent gracious and genuine responses as well as signed headshots to give away as prizes at the event. Jeremiah “Jean-Paul Jean-Paul” Birkett’s appearance that night was a surprise even to Dave, who explained that in earlier conversations with JPJP’s “people,” it seemed as though they didn’t want him doing anything without an appearance fee. But Dave’s shoestring budget didn’t have room for anything like that, so he crossed him off the list and moved on. Outside the context of a Seinfeld trivia night, it might be hard to place Jeremiah Birkett’s face. He’s a Caribbean guy in his early forties and in good shape, walking around Manhattan’s Upper West Side in a fitted black t-shirt, a leather jacket and jeans. But inside the four walls of Tom’s, even 16 years after the Jean-Paul episode (“The Hot Tub”) originally aired on NBC, he was recognized instantly as Jean-Paul, even before Dave could announce him. After the round was over, a few of us feverishly graded the answer sheets and tallied up the scores to determine a winner. Jeremiah bought us a little time, following Lou’s lead and telling a story about being hassled at the airport a few years ago on his way back from Amsterdam with his wife. A security guard looked at him funny for a few moments until realizing who he was, then proceeded to point at him, shout “Seinfeld! Seinfeld!” and eventually let him pass. When it was time to crown a champion, Why No T-Bone? had edged out Spongeworthy by a single point to win the night. It was retribution for Why No T-Bone?, who has won nearly every one of Dave’s Seinfeld trivia nights but finished second in his 2010 Seinfeld trivia tournament. Once Tom’s cleared out, Dave sat down–for the first time all night–with those of us who’d helped him throughout the event. As we sat there eating burgers, fries, and root beer floats, something seemed eerily familiar about a few friends sitting in a booth, having a conversation about nothing. *The Macinaw peaches came from Oregon. Several teams got this one right.